Dr. Dishauzi uses the AcuGraph Digital Meridian Imaging system as part of an integrated approach to your healthcare. The AcuGraph Digital Meridian Imaging system is a computerized tool used to analyze and document the energetic status of the acupuncture meridians. Dr. Dishauzi uses this system in a short examination by touching a moistened probe to acupuncture points on your hands and feet. AcuGraph is the premiere measurement tool of its type on the market today. It provides a fast and efficient exam, intelligent analysis, the most advanced treatment options, and allows Dr. Dishauzi to easily track your progress. AcuGraph is the natural choice for practitiones who are committed to high-quality care and outstanding results. As Dr. Dishauzi insists on providing the highest quality care, this is the most important reason he has chosen the AcuGraph system. 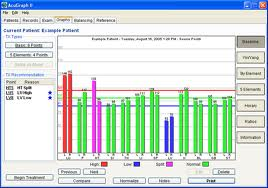 In summary, the AcuGraph system allows Dr. Dishauzi to measure and analyse the energy balance of each acupuncture meridian. Armed with this information, he can make better-informed decisions about your condition, and provide the best treatment possible.